Here is a manuscript obviously born out of Dave Arch's fascination with the Circus Sideshow genre. 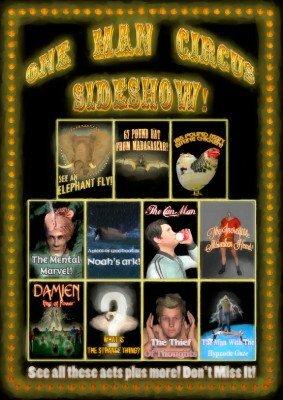 He has collected twenty sideshow attractions that he has presented from pure bluff to minimum skill, commissioned an artist to create a poster for each act and assembled it all into a 30 page manuscript. The attractions in this manuscript can be performed in a stand alone show by itself or inserted into your current show as an example of a bygone era when P.T. Barnum ruled the entertainment world. 1st edition 2012, 31 pages.